Top Notch Treecare joins forces with Bartlett Tree Experts! We are pleased to announce that Bartlett Tree Experts, an industry leader that has been providing state-of-the-art tree care for over 100 years, has invited Top Notch to become part of their international tree care firm. This arrangement will enable Top Notch to broaden its plant health care services, increase safety and training, and access cutting-edge research. Our clients will continue to receive the local attention they have become accustomed to, but now also benefit from access to Bartlett's resources and advanced scientific laboratory facilities. Because the existing Top Notch Treecare staff will be joining Bartlett, our clients can expect the same high level customer service and professional tree care. Top Notch Treecare has been committed to quality tree service since it was founded in 1982. Our ISA Certified Arborists are dedicated to maintaining your trees' health, appearance, and value to the environment. 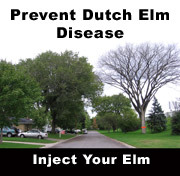 We offer tree and shrub pruning, tree removal, tree cabling, Dutch elm disease and oak wilt management, insect and disease control and several other tree and shrub care services in the Twin Cities area. Talk to an arborist about preventive treatment. Top Notch Treecare was the first company in Minnesota to receive accreditation from the Tree Care Industry Association. Top Notch Treecare is proud to be a division of Bartlett Tree Experts, and our staff now has the backing of an international tree-care company and tree research laboratory to help continue providing excellent tree service and shrub care in the Minneapolis area. View a complete list of professional tree services offered by Bartlett.